To cover for one of our staff members who left Spark!Lab, part-time members of our team have been working schedules with added shifts over the last seven months or so. We were delighted to hear our newest Facilitator, Mary Kate Robbett, would finally be cleared to join us on the floor of the children’s exhibit. In my personal opinion so far, working with Mary Kate has been a pleasure. She demonstrates organizational skills and a cheerful professionalism that have reinvigorated our staff and volunteers’ everyday experiences in the invention lab. We look forward to our future as coworkers with great interest. Among the many tasks required of a new Smithsonian staff member getting settled into the job, Mary Kate generously agreed to take some time to respond to some interview questions. We hope you enjoy getting to know her. What are your new responsibilities as a Facilitator? I engage our visitors in the inventive process. That looks different with every interaction, but it generally includes prompting our inventors to share their ideas, helping them to consider potential problems, and encouraging them to test and tweak their initial approach. I also help the Spark!Lab team as we experiment with new approaches and explore ways to tie the Spark!Lab activities into the history on display at the Museum. What previous background do you have in working with children? I’ve been a dance teacher for ten years. I teach ballet to every age group from toddlers to teenagers—and I love it! I received my BA in American Studies at Georgetown University and my MA in Museum Studies at George Washington University. Much of my academic work focused on eighteenth- and nineteenth-century US history. I wrote my master’s thesis on kinesthetic learning in museums. What’s your favorite thing about Spark!Lab? Our visitors! Their enthusiasm and excitement are contagious. On a daily basis, our inventors find new ways of using materials that would never occur to me. The kids and families we host constantly inspire me to stretch my own modes of thinking. What’s your favorite object at the Museum? My great-grandpa’s tool! My great-grandfather, Benjamin Zellock, immigrated to the United States from Poland as a young child in the 1890s. He began work in the Pennsylvania coal mines when he was only 13 years old. The Museum owns a tool, a “coupling” used to link two mine carts together, that he used as a young man. In 1966, a Smithsonian curator happened to travel to my great-grandpa’s town in search of objects to fill a new “Coal Hall” exhibit. My great-uncle Chet donated the coupling to National Museum of American History (then the Museum of History and Technology), and it’s still part of the national collections. Last summer, I had the chance to visit object storage and see the coupling. It was a highlight of my year! Infusing his projects with a passion for the invention process, Spark!Lab’s Interpretive Exhibit Coordinator develops clever and practical solutions. Although she doesn’t describe herself as ‘an inventor,’ Spark!Lab’s Floor Manager espouses the exhibit’s innovative spirit — in visitors’ lives and her own. 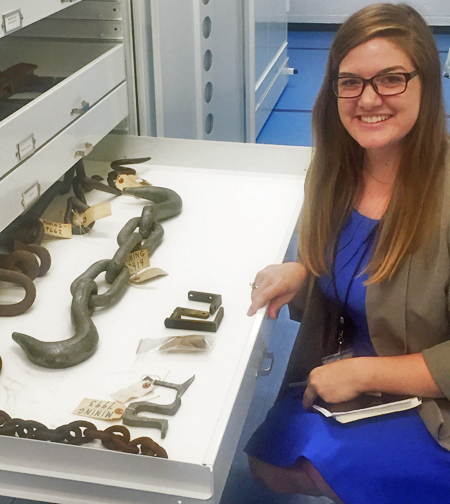 Spark!Lab’s Interpretive Exhibits Manager is all about cultivating innovation and creativity.